As we approach this long Memorial Day holiday weekend we here at A Bubbling Cauldron hope you will find some time to stop and contemplate exactly what this holiday is all about. In case your memory is a little vague on the subject, Wikipedia provides you with a little help, HERE. 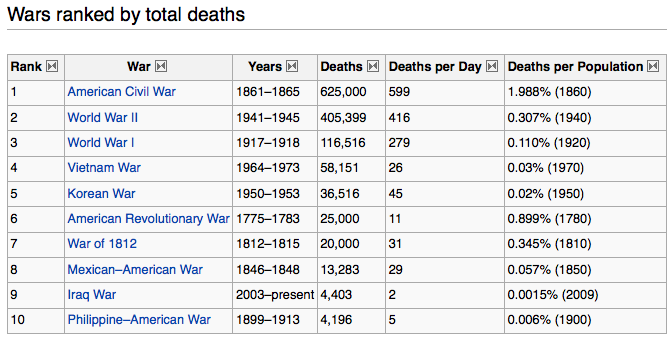 To remind you just why we honor our fallen troops, here's a little chart that will give you some perspective. 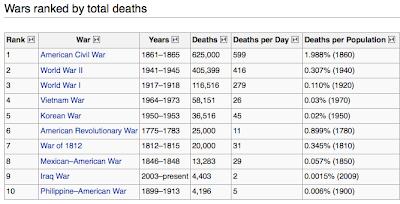 It tallies up more than a million lives lost in combat fighting to defend our country. This weekend please bow your head in gratitude to those who made the ultimate sacrifice for our freedoms. A couple years ago I wrote about this holiday. I think you may find that entry worth re-reading HERE. Now, let singer LeAnn Rimes help you contemplate this holiday. Remembering United States Air Force Flight Officer Edmund Anthony Jachacz - 20th Air Force, 468th Bomb Group. And the best father-in-law, too.